Masing greets GPS members at Rumah Geraman in Tada Ngemah in Kanowit. 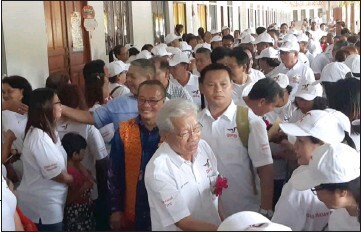 KUCHING: Deputy Chief Minister Tan Sri Dr James Masing has cautioned Sarawakians on the danger of accepting Prime Minister Tun Dr Mahathir Mohammad’s version of One Malaysia. Masing’s fear was compounded by Mahathir’s son Datuk Seri Mukhriz harbouring the same sentiment as his father. Masing said: “The dangers of accepting the concept of One Malaysia as suggested by Dr Mahathir, where the need of passport travelling in Malaysia maybe irrelevant later. Masing relayed this message in front of 1,000 people gathering at the 28-door Rumah Geraman at Tada in Ngemah, Kanowit where a minor rural project fund totalling RM138,000 was disbursed yesterday. Kanowit MP Datuk Aaron Ago Dagang and Hulu Rajang MP Datuk Wilson Ugak Kumbong were among the VIPs present. Aaron and Ugak also took the opportunity to brief those present on what actually happened during the tabling of the bill to amend Article 1 (2) of the Federal Consitution aimed at restoring the regional status of Sabah and Sarawak. If it was not done in a hurry and details were properly discussed, GPS would have supported the bill, the two MPs said. “Sarawakians will suffer. That is why immigration autonomy was stipulated in the Malaysia Agreement 1963 (MA63). Mukhriz wanted it abolished,” he added. It is therefore of prime importance that GPS must control the Sarawak State Legislative Assembly (DUN), he stressed. “That (Sarawak DUN) would be our last stand against Pakatan Harapan’s (PH) encroachment to our land and resources,” Masing said.